I absolutely love working with AAA. I have worked with this company for many years, for all different types of trips. Always easy to work with! We communicated via AirBnB, and the communication was easy and direct. This was the perfect property for our family. We enjoyed the generous spaces, especially the fireplace and the galley kitchen. The many bathrooms were also very convenient. excellent staff, gave us a courtesy call the next day. My wife and I agree this was truly one of the best places we have stayed at. The creek right by the cabin was PERFECT! Best bed I think I have ever slept in. Great stock of appliances dishes utensils etc...fireplace. Everything was just perfect. And the heated floors in the kitchen were awesome on cold mornings! My experience working with the team was very good, starting with changing the dates of our trip, to receiving a call after we checked in to ensure we had all that we needed in the house. Staff was very responsive and friendly. 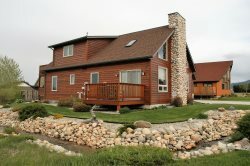 Our stay at the house was great; we enjoyed being within walking distance to town, the hot tub was great after skiing, and the house was clean and comfortable. We will definitely recommend to others, and hope to return! Such a homey place to stay on vacation. When we arrived the lamps were on and it was just like we were home. We will definitely be back again! upstairs bathroom and some bedroom doors would not lock in main house. cottage bath also would not lock. no broom or dust pan to clean up after ourselves. The team called to be sure everything was going ok and check in, we appreciated that! We really liked the property and felt like the management team was friendly. Wed definitely stay again! The phone call Saturday morning asking if we needed anything was very appreciated. It was a painless experience renting the place, no complaints. The team members I dealt with were great. They guided me through picking the perfect rental and were professional and friendly. We had a great time at Piece of Mind. The houses were wonderful as was the location. The hot tub was a perfect way to end a day spent skiing. Thanks again!